Christ Church is a parish of the Episcopal Church in the worldwide Anglican Communion, located right in the urban heart of downtown New Haven adjacent to Yale University and the city's lively arts district. As a congregation dedicated to God's mission in Jesus Christ, we seek to show that a commitment to liturgical worship can go hand in hand with a commitment to active service in the world. We seek to show that a call to daily prayer can go hand in hand with a call to daily action. We seek to show that tradition points us forward to new ways of doing old things, as well as grounding us in the shared history of the Church through which we are connected to the Apostles and to Christ himself. We warmly invite you to join us in worship, whether weekday prayer or a Sunday Mass. We also invite you to the service ministries in which we share, including the Community Soup Kitchen and Saint Hilda's House. Whatever form it might take, all are welcome as we seek to live the life to which Christ has called us. Christ Church Parish was founded in 1854 as a mission of the city’s first Episcopal parish, Trinity Church. The parish was created through the generosity of the three Edwards sisters, parishioners of Trinity who were strong adherents of the Oxford Movement. 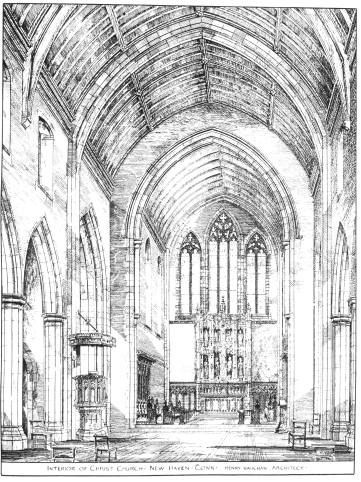 The early mission enabled New Haven Episcopalians to receive Holy Communion more than once a month (uncommon in the Episcopal Church at the time) and to attend Morning and Evening Prayer during the week, and by 1856 attendance at Christ Church grew to ninety-three families, with over one hundred and fifty Sunday School children. In 1910, Fr Frederick Burgess established deaconesses in habit (eventually three in number) to be resident at Christ Church. These deaconesses served the sacristy of the church, the children of the church school, and the poor and orphaned of New Haven until the early seventies. They lived in St Hilda’s House and moved among the life of the parish and the City of New Haven. St Hilda’s House continues today in the form of an intentional community of young adults who choose to spend a year serving the community of New Haven. They seek to continue the mission of the deaconesses in their ministries, although they do not wear habits! The Community Soup Kitchen has been operated in the Christ Church parish house since 1978, when the Fr David Boulton (rector from 1978–83) proposed that the soup kitchen make use of the large dining hall. Today, it is New Haven’s primary soup kitchen, providing a vital ministry to the urban poor by serving as many as 400 people in a day. Albert Powell teaching Sunday School, 1962. Christ Church has long been a center of Anglo-Catholic worship. Anglo-Catholicism seeks to promote authentic praise of God by sharing in the traditions of worship practiced by Christians since the Early Church. At Solemn High Mass on Sundays we try to bear witness to the divine mystery through the music of our professional choir and a liturgy which centers around the full ministry of Word and Sacrament. In 2009 Christ Church was the site of the inauguration of the North American province of the Society of Catholic Priests. The parish still seeks to be an example of progressive Anglo-Catholicism, eschewing the false dichotomy of worship or service and instead seeking to ground people's lives in the intentional worship of God and acts of service to the community. It has long affirmed the role of women in the church's ordained ministry, and is inclusive of all persons irrespective of race, gender, sexual orientation, social class, or any other differentiation.